Easy Updates Manager currently helps more than 200,000 users automatically keep their sites up to date and bug-free. It’s also highly customizable to give you real control over what updates to run. What does Easy Updates Manager do? No need to login and check for updates. Auto Updates saves tons of time. Choose and turn on/off individual core, plugins, and theme updates. View logs of updates that have occurred. Useful for debugging and rolling back your site to an older working version. Is your site up to date and secure? Or is it outdated and buggy? Easy Updates Manager is a powerful WordPress tool that enables you to fully manage updates for all of your plugins, themes, core, and translations. 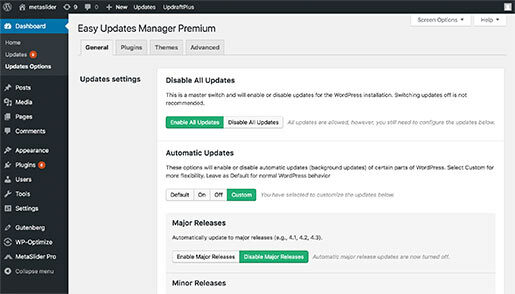 This plugin makes managing your WordPress update settings quick and easy – and because it offers endless possibilities for configuration, it puts you in complete control of how, when, and what to update and what not to. Easy Updates Manager is also multisite compatible and includes built-in logs for your convenience that lets you take a look at updates that have occurred. Logs include the version it was updated from, so this helps in case you need to rollback a dodgy update. Reliable, intuitive and very highly-rated, Easy Updates Manager makes quick and easy work of your updates; a task that that would otherwise be a complicated, and time-consuming process. To get the most from your website! it is important to have the latest release of WordPress installed and have updated versions of any themes and plugins you’re using. Staying on top of updates ensures that your website is free from security vulnerabilities, protected from bugs, and enhanced by the very latest features of your plugins, themes, and WordPress. Reliable, intuitive and very highly-rated, Easy Updates Manager makes quick and easy work of your updates; a task that would otherwise be a complicated, time-consuming process. Easy Updates Manager’s automatic update function allows you to simply “set and forget” with multiple settings options to personally customize updates on each individual aspect of WordPress core. These updates can include major, minor and development updates, as well as your themes, plugins, and translations. As many developers use their own themes and plugins, we have found that a particular feature of Easy Updates Manager that has become hugely popular with our users is the ability to disable automatic updates. This option can assist in preventing code from being overwritten and help protect and maintain security and functionality. If you want to help contribute to the translation, please go to https://translate.wordpress.org/, select your language and search for the Easy Updates Manager plugin. We appreciate all the translation help we can get.